The Moderate Resolution Imaging Spectroradiometer (MODIS) on NASA's Aqua satellite took this image of Super Typhoon Jelawat on Sept. 27, 2012. The distinct eye of Super Typhoon Jelawat was on display for NASA's Aqua satellite today (Sept. 27) as the storm raged over the Pacific Ocean northeast of the Philippines. Jelawat is currently sporting winds of 155 mph (250 kph), and the storm is hundreds of kilometers in diameter, certainly living up to the name "super typhoon." 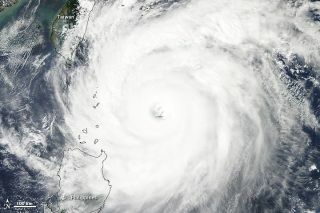 Typhoons are the name given to tropical cyclones in the western Pacific Ocean; they are the same phenomenon has hurricanes. A super typhoon is equivalent to a Category 4 or 5 hurricane on the Saffir-Simpson scale. Jelawat's winds would classify it as a strong Category 4 storm, bordering on Category 5. Jelawat is located about 390 nautical miles south-southwest of Kadena Air Base in Okinawa, Japan and is moving toward the north-northwest, according to the latest update from the Joint Typhoon Warning Center (run by the U.S. Navy and Air Force). The current projected path for the storm takes it on a possible collision course with the main Japanese islands late this weekend or early next week, though the storm is expected to weaken into a typhoon by that point. This story was provided by OurAmazingPlanet, sister site to SPACE.com.